From far and wide all across North America, Piper Cub owners are planning to attend EAA AirVenture 2017, which will be held July 24 thru July 30 in Oshkosh, Wisconsin. 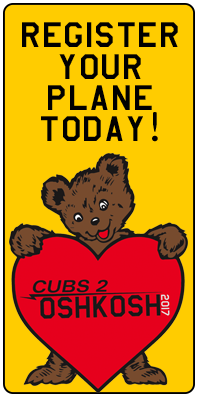 There will be a gathering at Hartford before AirVenture, mass flight of J-3 Cubs into Oshkosh Sunday morning, special parking for Cubs at Oshkosh and much, much more. This website is designed to keep you updated on the latest information on the Piper Cub events surrounding EAA AirVenture 2017 (including gathering points on the way to Oshkosh), along with providing an interactive community for all Cub owners and pilots leading up to the big event. To keep it simple, EAA has agreed to send everyone interested in flying a Cub to Oshkosh 2017 for the 80th Anniversary of the Piper J-3 Cub to this site. Steve Krog will be providing signup information for the Hartford portion of the celebration on this site. Those that have already registered at the EAA site should become a member of this site and stay tuned.